Surfing has long been synonymous with the Californian lifestyle. 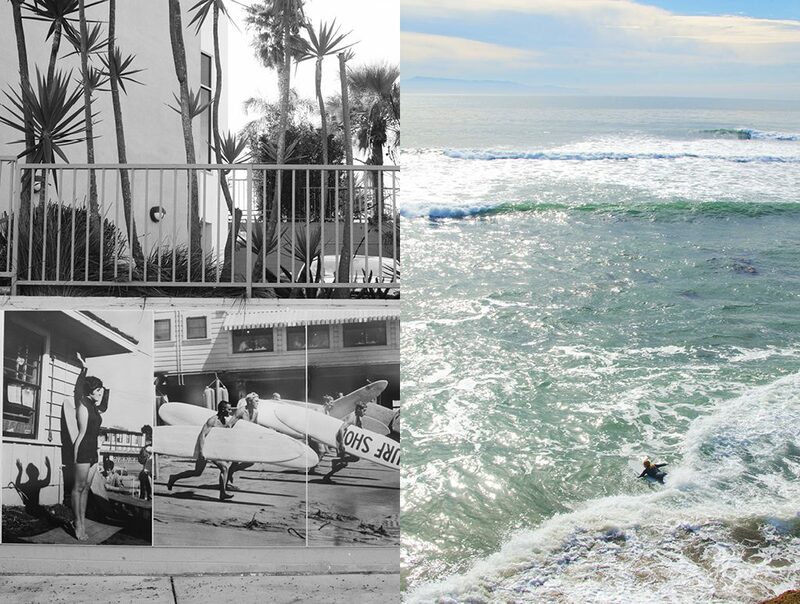 The story of how surfing came to the beautiful shores of California, however, is scarcely known. 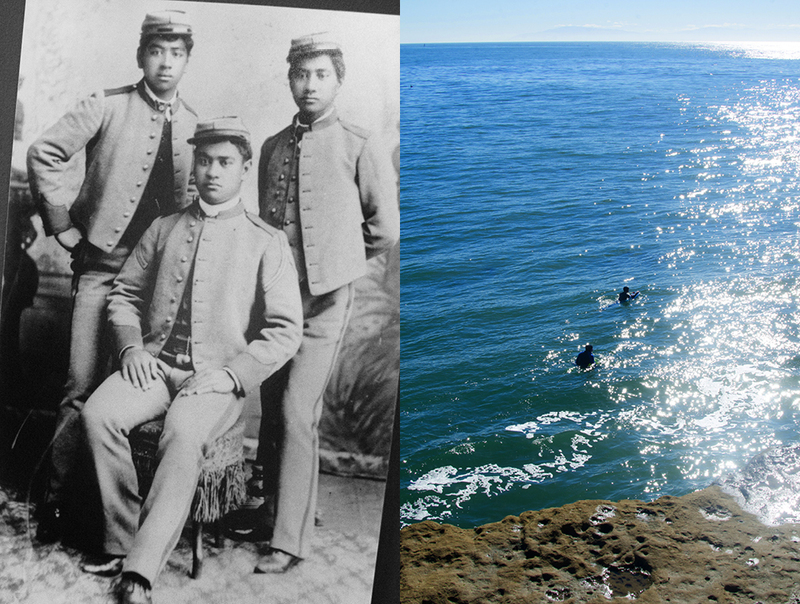 It all started with three young Hawaiian princes attending a military academy near Santa Cruz. A newspaper article reported on this first-time event on an otherwise average weekend. Further east along the beach, however, at the mouth of the San Lorenzo River, history was about to be made. Three Hawaiian princes—David Kawananakoa, Edward Keliiahonui and Jonah Kuhio Kalaniana’ole—were in the water with long surfboards made of local redwoods, and milled in the shape of traditional Hawaiian o’lo boards, traditionally reserved in the islands for royalty. Their uncle, King David Kalakaua, a renowned surfer at the long break along Waikiki Beach, had taught them to surf. Though no one knew it at the time, that afternoon altered the course of history in the Santa Cruz community. And the rest, as they say, is history. 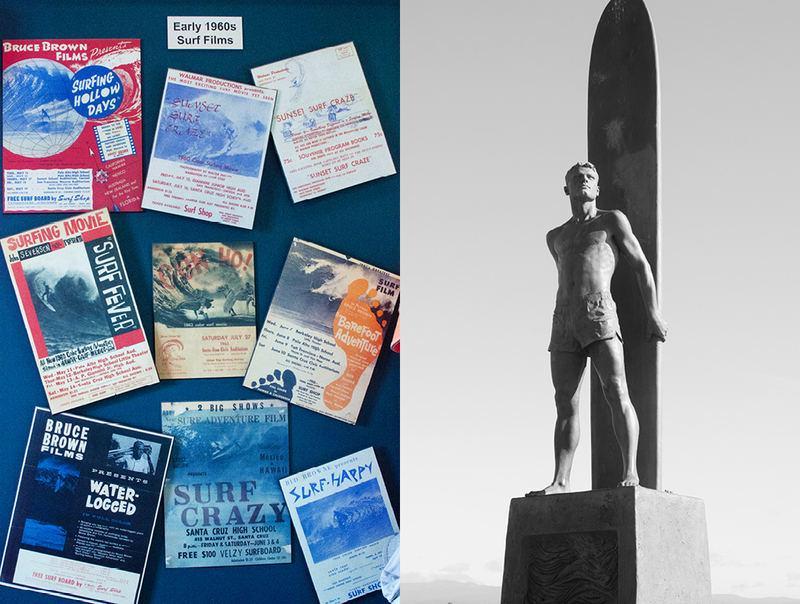 Fascinated by this obscure bit of history, we were curious to explore Santa Cruz to find who carries on the tradition of surfing started by those three Hawaiian Princes. 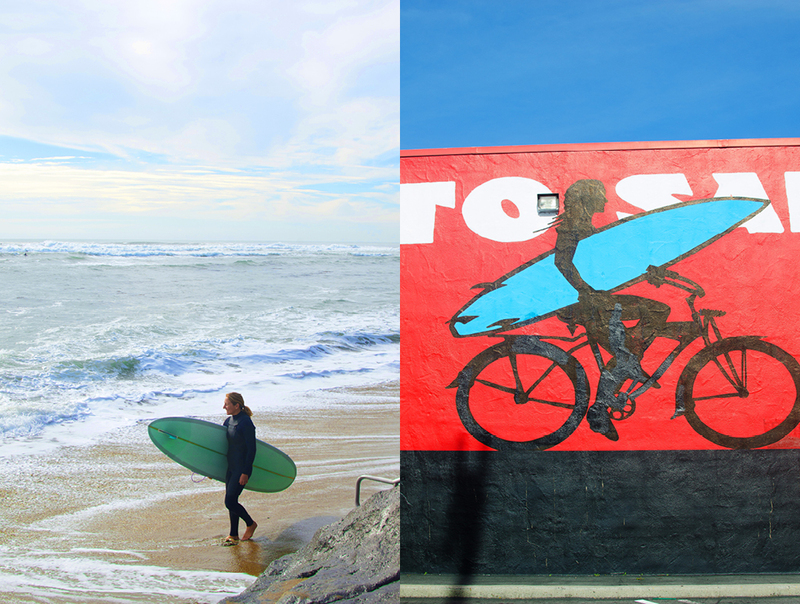 Here are our picks for the three best candidates for Santa Cruz surf royalty today. Avid outdoorswoman, Stacy Forrester, likes to fish and hike, loves to work with wood, and, of course, surfs. 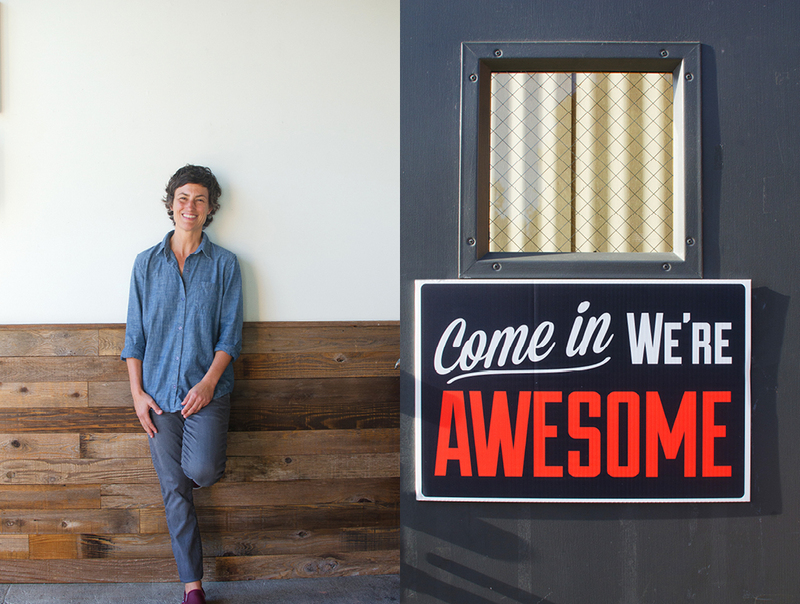 After spending many years representing a series of well-known outdoor brands, she decided to bring her own vision and style to like-minded open-air aficionados in Santa Cruz and beyond. 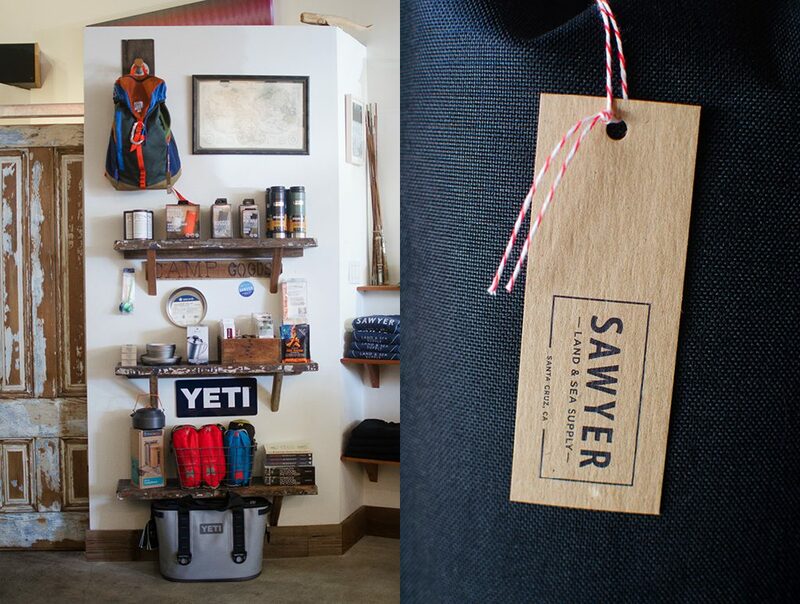 Sawyer was named after Stacy’s grandfather, who Stacy says instilled in her the outdoor bug. 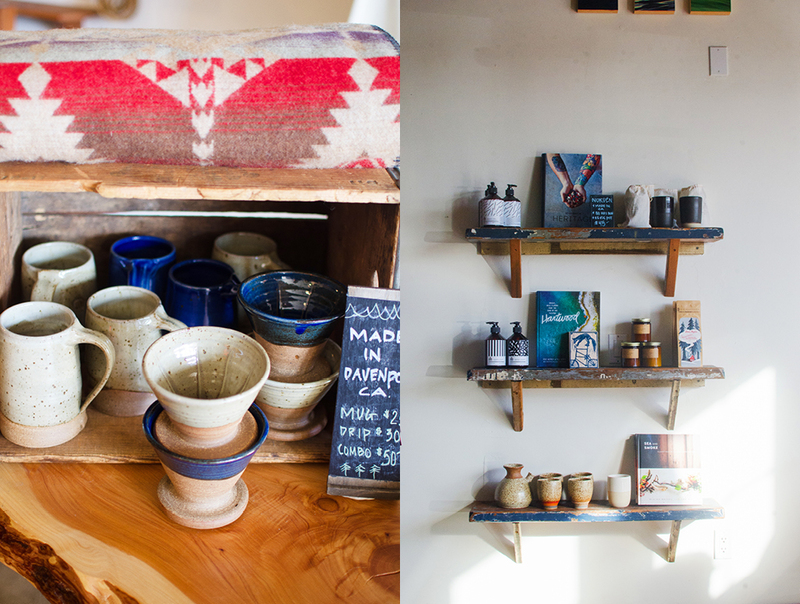 In her collection, she seamlessly merges equipment, apparel, literature, and art, for and about outdoors activity. She has curated a collection of clothing attuned to outdoor performance but also with an eye towards everyday wear. 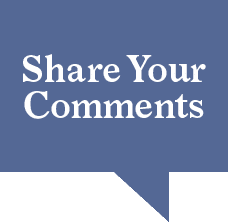 After all, performance apparel can be pricey so it would be unfortunate to be able to wear it only when you are engaged in one activity! 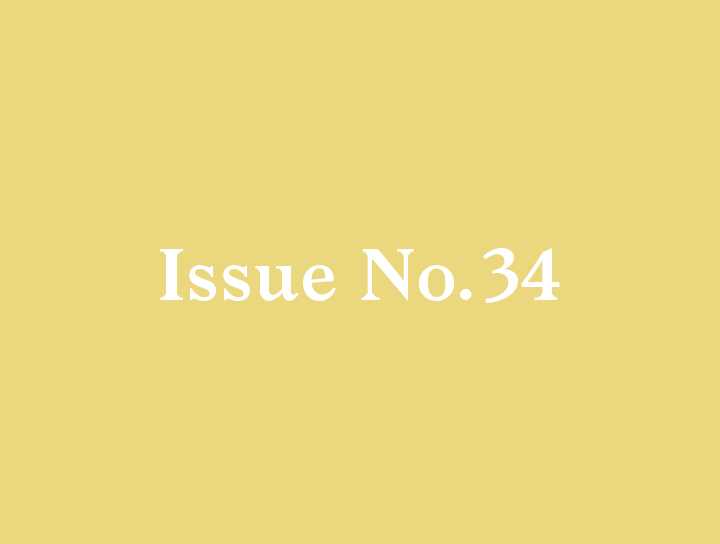 I fell in love with a shirt she had on one of her racks—a perfect long-sleeved indigo blue T-shirt. Simple, great quality and super stylish. Curating her collection from a range of land and sea apparel companies, Stacy’s eye for style makes the combination on the rack seem like it’s her own fashion collection. While we are browsing, a steady stream of loyal customers (many have become friends) comes and goes. Sawyer Land & Sea Supply has become a community meeting spot: a place for those of similar interests to come and exchange ideas while Stacy puts all visitors at ease. One of the nice things about Sawyer is that many of Stacy’s best items cannot be found online, so you have to go in and discover. It makes the trip to Sawyer Land & Sea Supply a real treat. In today’s bland retail landscape where everywhere you go in the world you see the same shops, Sawyer’s is one of those rare one-off retail experiences you wish you would stumble upon more often. 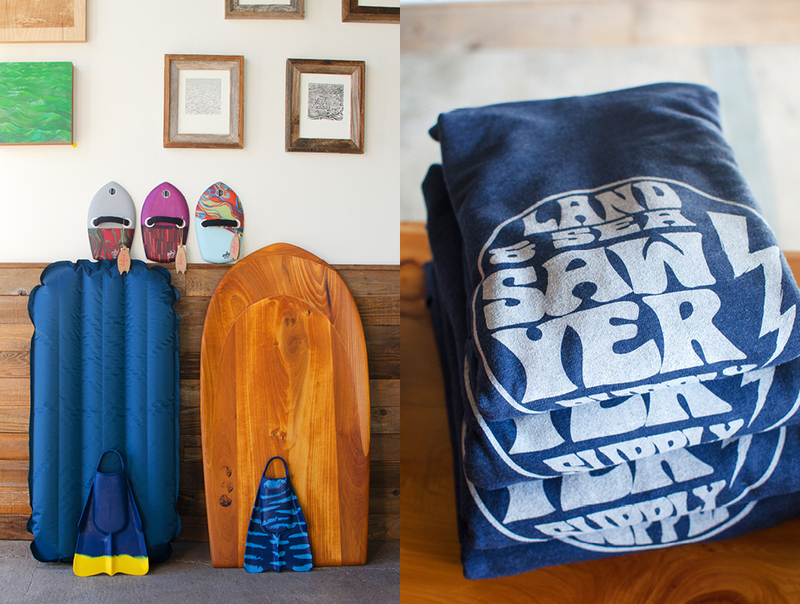 Before we leave, Stacy divulges a secret: She is hard at work on the Sawyer Land & Sea Supply clothing line, which combines Stacy’s extensive experience, her love for the Santa Cruz lifestyle and her passion for the outdoors. We will certainly be back soon for that. 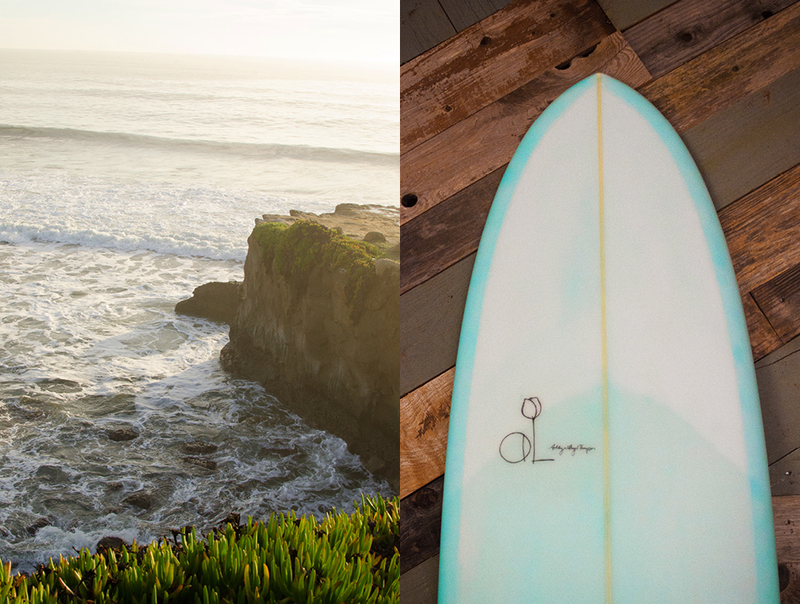 Our next Santa Cruz surfer-royalty entry was recommended by Stacy. 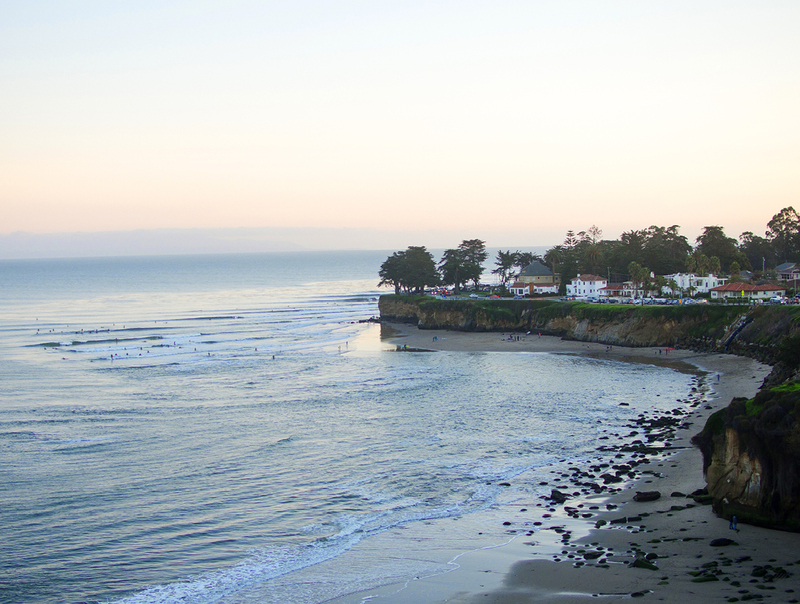 We make our way down the beautiful Santa Cruz bluffs as the waves follow us along. 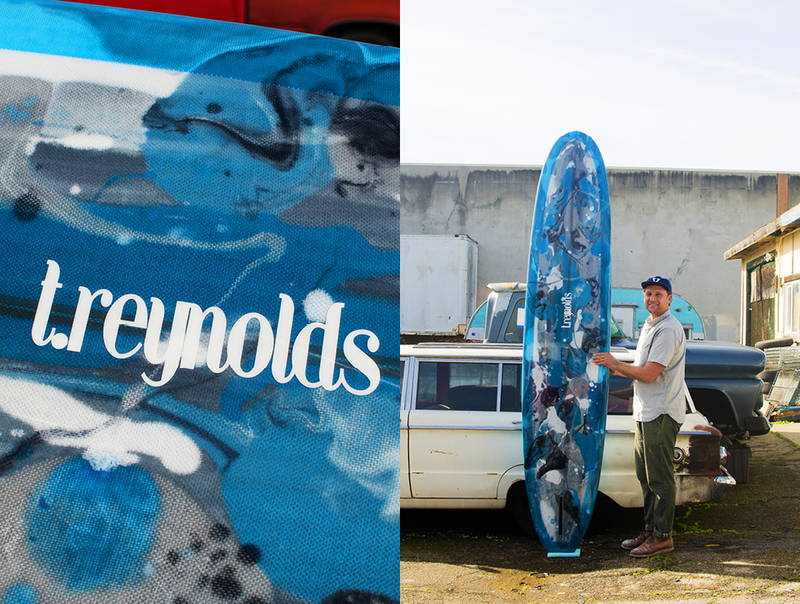 We are heading over to Santa Cruz’s “Westside” to meet Ashley Lloyd Thompson, a surf instructor, artist, musician, young mother, and one of a rare breed, a female surfboard shaper. Ashley grew up in Santa Barbara and first gained recognition competing as a professional surfer. Taking a slight detour north, she is now at the helm of a new Santa Cruz concern, Ashley Lloyd Thompson Surfboards, a custom surfboard design and shaping company. With a brand-new shape shop just recently opened for business, most days you can find Ashley decked out in her signature white hazard suit and a mask eyeballing the symmetry of surfboards’ curves, with specific surfers in mind. Ashley’s process is very up-close and personal. Being also an instructor, she has an intuitive sense for just the right board shape to match a surfer’s style, proficiency, and physical proportions. 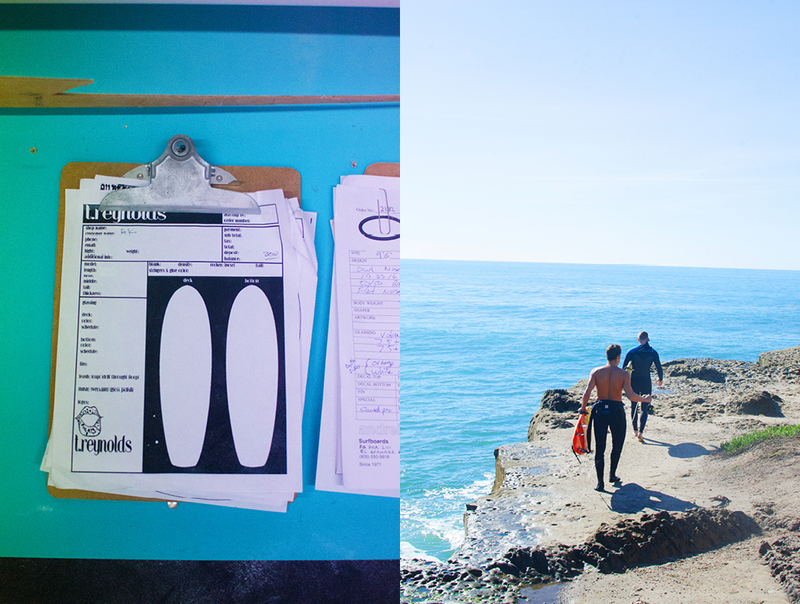 Apprenticing early on with several well-known surfboard shapers, she built a stellar reputation over time, and now, on her own, her business is taking off. 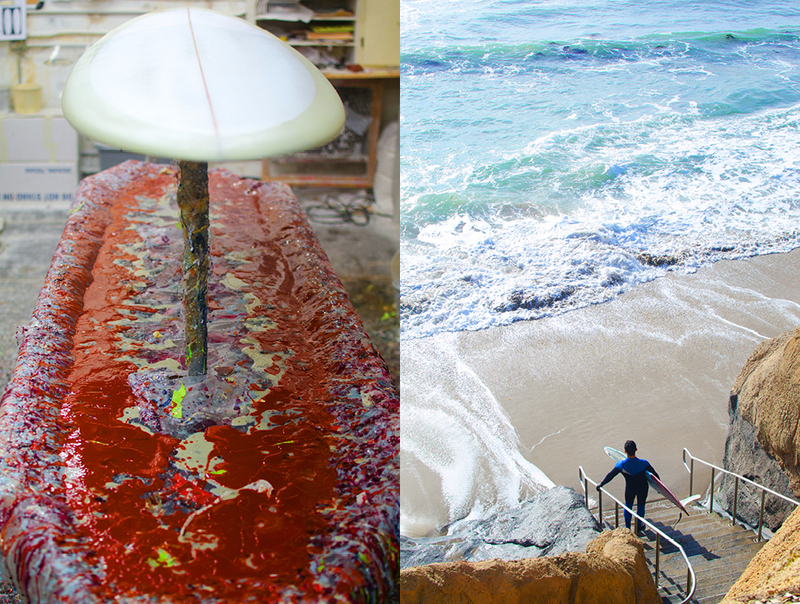 Surfboard shaping has always been a bit of a toxic process, but in recent years most of the material making up surfboards comes from various chemical innovations: foams, fiberglass, and resins. Thinking about this, the environment where surfboards are manufactured is in stark contrast with the nature of the environment where they are used: a bit of a disjuncture there. Determined to find a mode of manufacture equal to the natural environment in which surfing is practiced, Ashley utilizes a process involving bio-resin to finish her surfboards. A happy byproduct of Ashley’s more ocean-friendly process is that the colors of the boards are translucent and varied in intensity, producing a kind of watercolor effect. 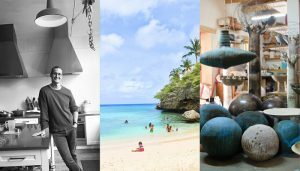 The resulting designs are more Paul Klee than Mondrian and are becoming a recognizable signature of Ashley’s pursuit of a healthy surf culture from board to surf. 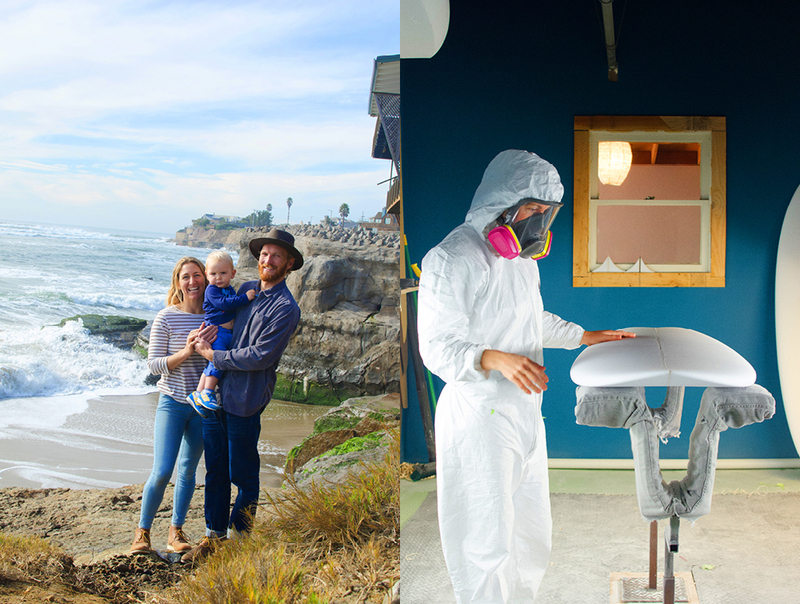 From the shape shop, we head over to the beach to meet Ashley’s husband and collaborator Alex Thompson, as well as little Odin, who is already getting into the act, waxing mom’s board with much gusto. Odin just recently started walking but he has his eye on the waves. It won’t be long before he’s up on a board just like his mom. Talking with Ashley about her art, she speaks about the “knowledge of waves”, a sense acquired only through hours of patient observation and learning about how to move within the rhythms of the sea. Listening to her expound on the experience, it occurs that a feminine perspective on the art brings to the sport a whole different understanding than I had thought about. From aesthetics to manufacturing to how one interacts with the waves, Ashley is carving out an interesting space in what has been a very male-dominated arena. 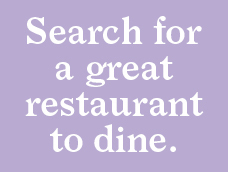 I think it is a great thing. The day of our visit coincides with El Nino and as the day draws to a close the surf is having a bit of a mood. The beach fills up with droves of surfers anxious to test their skills. I ask Ashley how she finds her customers. She laughs and says she meets a lot of them in the water. That’s the kind of social marketing I can relate to. Very much looking forward to coming back soon to have a surf lesson with Ashley. The next morning is another glorious sunny day and we are up early to meet Travis Reynolds, another Santa Cruz born and raised local who has turned his passion for the waves into a thriving enterprise. Travis caught the surf bug early. At the age of ten, he started to surf at Pleasure Point, which was just a stone’s throw away from his mom’s house on the west side of town. On occasion, he would visit his dad in Hawaii, giving him the good fortune of being exposed to some of the world’s best surfing from an early age. 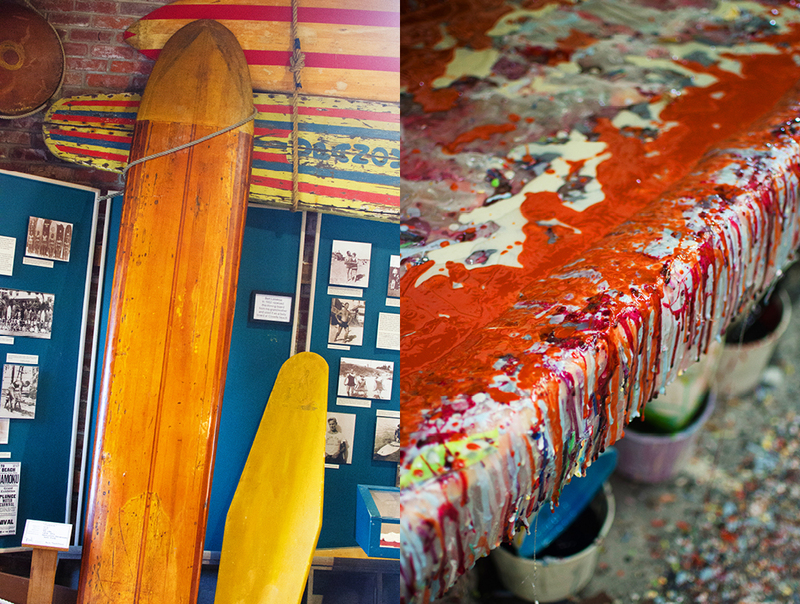 Surfboards are not cheap, and for many surfers their first board is a homemade affair. Those who enjoy the at-home experience often begin by making a friend’s board, then another’s until, presto, it’s a business. This was Travis’ route to his dream job of surfboard shaping. 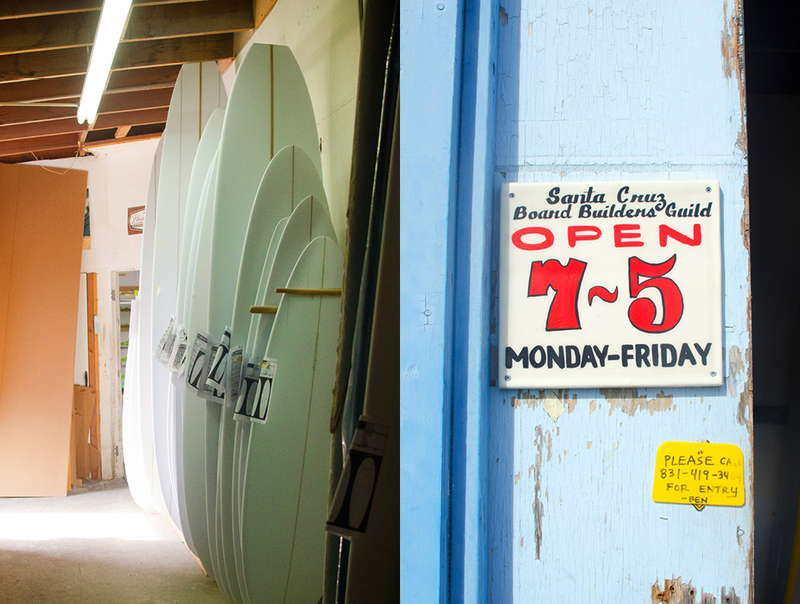 Travis runs his shop out of the esteemed Santa Cruz Board Builders Guild: amongst surfers, an institution in itself. From the moment you crack open the front door, you are lost in a maze of new boards, all in different stages of production. Travis escorts us to his center of operations while beginning to describe his process of working with a client to build a board. Without knowing much about this, you have the impression that it’s a simple process, much like buying some new clothes. Actually, it is much more like buying some bespoke new clothes on Savile Row where the discussion is much more about how you’re feeling and what your goals are, than the measurement of your waist. 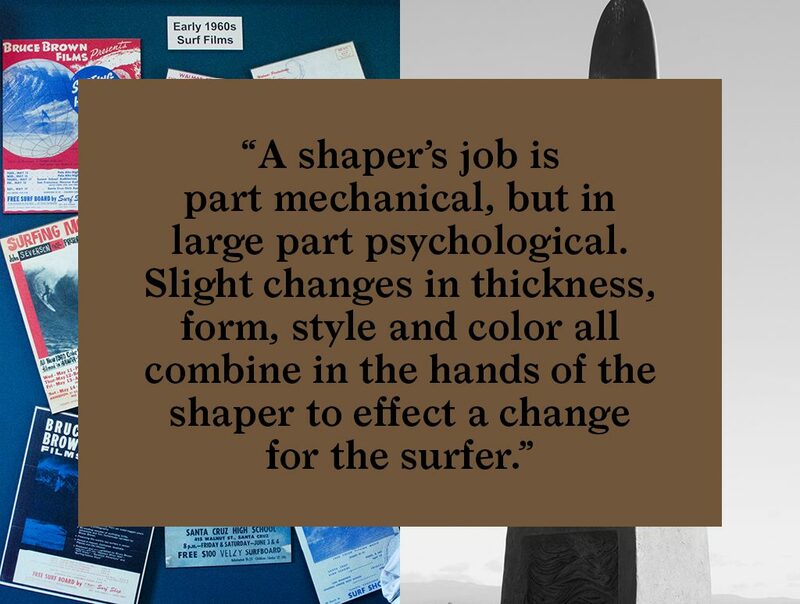 A shaper’s job is part mechanical, but in large part psychological. Slight changes in thickness, form, style and color all combine in the hands of the shaper to effect a change for the surfer. That’s why no two board are ever the same. Looking at one of Travis’ almost-finished long boards, it’s spectacular to behold. It makes one appreciate the true artistry of this very bespoke process. Comparing boards from Ashley and Travis, they could not be more different, but both lead to fabulous experiences for the surfers who ride them. Both Ashley and Travis mentioned that, surprisingly, people sometimes order boards simply for decoration. Although they are truly works of art, I had always seen them as more of a practical item. But having seen the whole process and the amazing artistry that goes into them I could absolutely see how having a board just to look at would have a benefit all its own. With much more to think about than we had anticipated, we took advantage of the amazing Santa Cruz morning weather and sat at the water’s edge for a bite. A few surfers in wetsuits and bare feet passed by on their way to take advantage of the excellent morning waves. 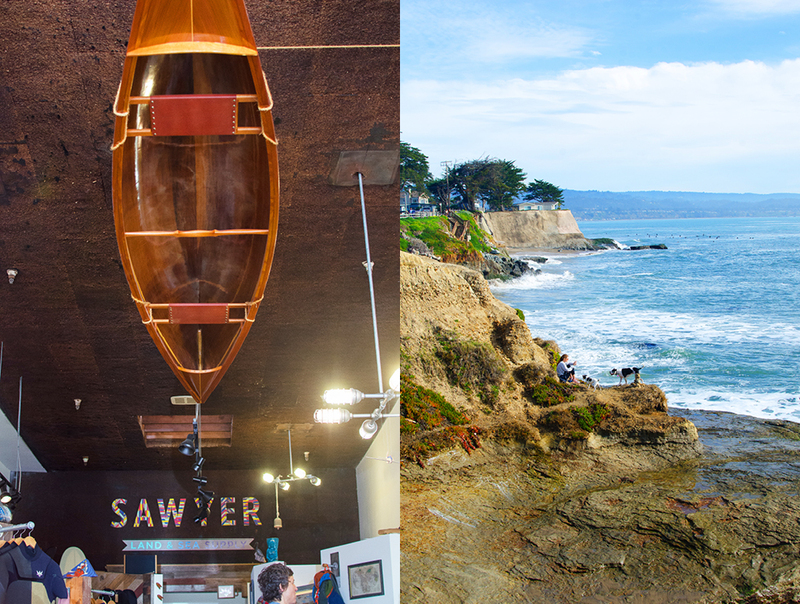 A super relaxed attitude and manner characterized all of our interactions with people in the Santa Cruz surf community. Maybe it’s something about spending much of your time outdoors, or having to contend with forces much larger than yourself and finding just the right moment to harness them. Hard to know. I do know that New York could sometimes do with a good dose of it. And to think that without those three Hawaiian princes none of this would have happened. 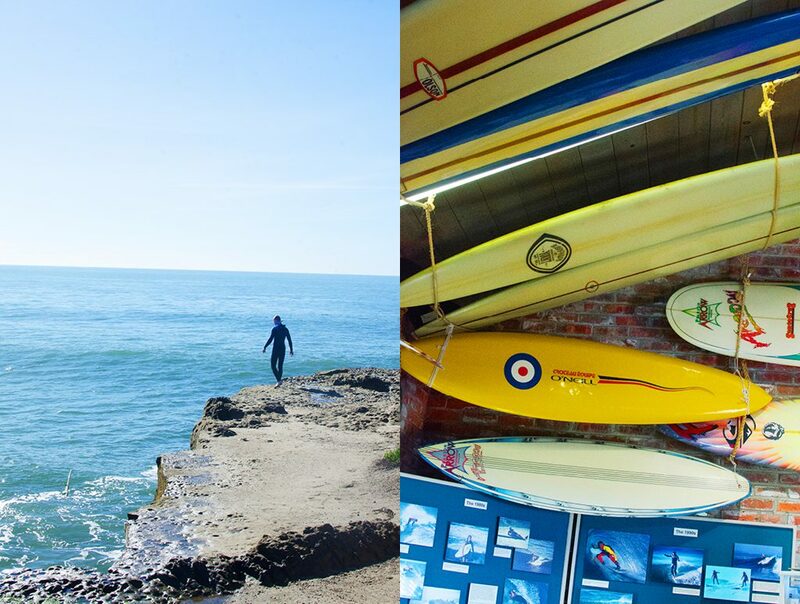 Planning a surf trip to Santa Cruz? Here is the current weather and what to expect for the next few days.